Commemorating "NITRO SUPER SONIC 2013!!" One of the items sold at "NITRO SUPER SONIC 2013," held from Sept. 21 - 22, 2013 at the Tokyo International Forum. 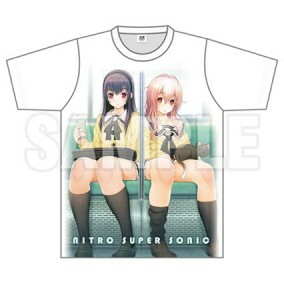 From the hit computer game "TOTONO," this t-shirt features a large print of heroines Miyuki and Aoi. All sizes are listed as standard Japanese sizes. Please be sure to check garment measurements. Size exchanges and returns not accepted. Originally available at "NITRO SUPER SONIC 2013."